As I cropped and sized Bruised Twilight I was reminded of the Frank Stella retrospective hosted at the Fort Worth Modern last year (2016). I visited a total of three times while the work was here, and each time I was awed and inspired by the breadth and the beauty of the work, as well as encouraged by what I realized to be the natural progression of the abstract expression process modeled by a master. That progression is something I experienced prior to becoming familiar with Stella’s work. Expressions either grow more and more complex, or more simple. They can be layers and layers of gesture lines and color, or they can be deep color fields. But, as that practice matures and the extent of the technique is fully explored, the next logical step is to take those techniques to alternate surfaces. I have explored that both in my Under-Works series and with my geometric paper sculptures. It was very reassuring to see this same progression in Stella’s work and read his explanation in the accompanying monograph. However, the real surprise, the thing that brought me to tears all three times I saw it, was the hideous beauty of his massive sculptures, especially The Raft Of The Medusa, part 1. I could not look at “part 1” without my eyes welling up and water rolling down my cheeks. And yet, the framework on which the work was built almost gives it the appearance of floating in space from certain angles, as if this might have been a lifeboat from a crippled starship. It is in the vein of creating beauty, even if somewhat hideous, of and from that which seems lost or hopeless that also speaks to me and through my practice. Materials which would normally be destroyed, dismissed, or discarded can give voice to joy, hope, courage, truth, and goodness. 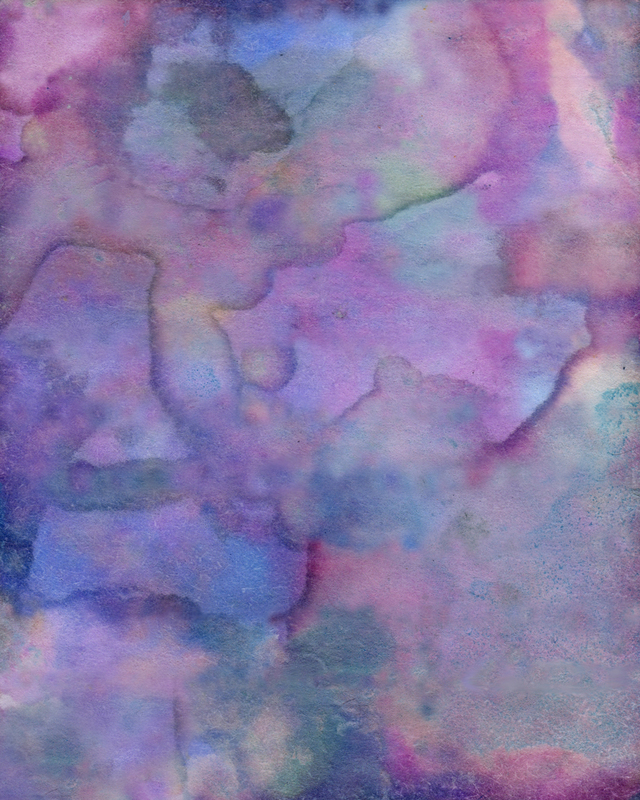 Case in point, the image presented here, Bruised Twilight, was a scrap of note paper with which I soaked up excess inks from a project. As I looked at the scrap after it had thoroughly dried, I was struck with its beauty. The original piece was lined, so there has been some extensive editing of this final image. This is, or should be if things work out, an introduction to a series of similar projects which I am thinking of as the Hideous Beauty series. Thank you for joining me on this journey. If you would like to support this work, in particular the Hideous Beauty project consider becoming a patron here. I am currently offering Bruised Twilight as a limited edition print in a run of 25, 18″ x 24″ acrylic panels For details on purchasing one or more of these prints follow THIS LINK.